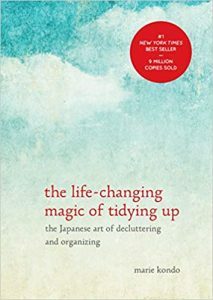 Are You Tidying Up With Marie Kondo? Ready to tidy and toss? So here’s what I’m talking about. 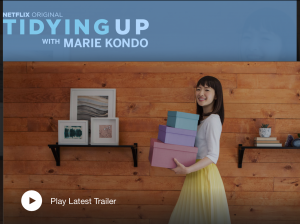 There is a new Netflix series, “Tidying Up with Marie Kondo,” and it’s gaining lots, and I mean lots of attention and it all started with the great success of Kondo’s book, The Life-Changing Magic of Tidying Up. It’s so freeing and yes, fun to have an organized home. Especially your clothing closets and drawers. To be clear, I’m a wardrobe stylist and not an organizer, but when you’re closet is only filled with clothes that fit well and look great on you, you’ll find it easy to get rid of the pieces that “don’t bring you joy” and the outcome is always a better looking and more organized closet. I especially like her tip on how to fold clothes and scarves in drawers. You can see her method in the post I wrote here, right after I had read her book. In order to get out the clothes that are unflattering, you need to know what to look for and to avoid, and that’s why last year I created a free closet clean out challenge called End Your Closet Shame and an on-line Course Dress Without Stress. NOTE: The course is sold out now and will re-open in late spring. you inspired to toss and tidy up. How about it? Ready to tidy and toss?